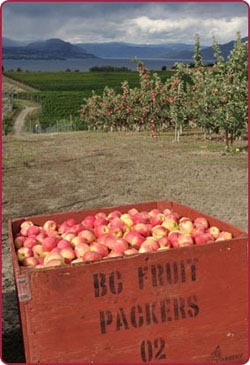 Growing Ambrosia apples in the Okanagan Valley in BC. “The secret is in the seed.” – it is the inspiration for the Ambrosia logo and it is the story of the Ambrosia apple that originated in a beautiful orchard in the sun-drenched Similkameen Valley of British Columbia. The first Ambrosia apple tree appeared unexpectedly in Sally and Wilfrid Mennell’s orchard in the early 1990’s. They were uncertain of the parentage of the tree and could only guess at the origin of the seed from which it sprouted. They did note, however, that when the tree finally fruited, the apples were so attractive and delicious, that pickers working in the orchard stripped the tree clean and ate all the fruit. The Mennells decided to produce more of the fruit and to their delight, the resulting apples were as perfect in appearance and taste as the apples from the original mother tree. They were excited because they knew that really good apple varieties were extremely rare and the chances of finding that one perfect seed was even less likely than winning millions in a lottery. The Ambrosia logo depicts a cross-sectional apple slice with the one special seed. While this reminds us of the wonderful story behind the Ambrosia apple, it has a more important function. The Ambrosia logo is a mark of guaranteed quality. It means that all the irresistible qualities that were packaged in that one seed are delivered to you as if you were standing in the Mennell’s orchard eating the summer ripened fruit from the first Ambrosia tree. Always look for the Ambrosia logo on the apple stickers to guarantee that you are getting the finest quality apples. So how do we guarantee that you are eating the very best Ambrosia apple? The effort to deliver the finest quality begins when the orchards are first selected and the trees are planted. The highest quality Ambrosia apples are grown in areas with warm sunny days and cool nights. The sunshine delivers exceptional taste and texture whereas the cool nights are essential for the luminescent colour of the apples. Ambrosia trees are also grown close together in narrow rows so that all the apples are exposed to the sun and the fruit develops close to the main stem – the major thoroughfare for sugars from the leaves. Ambrosia orchards are carefully pruned every year to maintain their compact growing structure. And in the spring, after the bees and other pollinators have visited the orchard, extra flower buds are removed from the trees to make sure that the trees do not have too much fruit. Too many apples on one tree will result in small fruit with weak taste and colour. The harvest timing of Ambrosia apples is especially important in guaranteeing the quality of the apple you will buy in the store. The apples are typically harvested around late September to early October in the Northern Hemisphere. However, Ambrosia apples have one of the shortest harvesting windows of any commercial apple variety. This means that quality Ambrosia growers must be especially vigilant and must carefully monitor the ripeness of the apples in the weeks leading up to harvest. An unripe apple stores its carbohydrates as starch – giving it a floury texture – but as an apple ripens, the starch is converted to sweet sugars. This conversion of starch to sugars occurs very rapidly in Ambrosia which accounts for its short picking window. If Ambrosia apples are harvested too soon, they will have poor taste and texture, and, if harvested too late, the apples cannot be stored without becoming soft. Therefore, quality Ambrosia growers sample their orchards each day to determine if their apples have started converting starches to sugars. They harvest the apples when about half of the starch is gone and they know, based on years of research and experience, that these Ambrosia apples will provide an exceptional eating experience when eaten even after months of storage. Scientists at Agriculture and Agri-Food Canada have also provided the key to maintaining premium quality during storage of Ambrosia apples. After Ambrosia apples are carefully handpicked from the orchards, they are transported to specialized packing facilities where they are stored under specific environmental conditions. Low temperature and oxygen levels slow down the apples’ natural development while preserving their best eating qualities. These storage conditions are precisely and continually monitored to ensure perfect conditions throughout the storage period. Immediately before delivery to you, the consumer, the Ambrosia apples are removed from the special storage conditions and graded and packed. Each apple is weighed – to sort by size – and photographed multiple times by an infrared camera. This camera can identify external blemishes and poor colour – and it can even see rotten spots inside the apple! The bad apples are removed and the remainder are inspected a second time by specially trained staff before being packaged for delivery to stores. Now you know the secret is in the seed. And remember, only the finest Ambrosia apples from the highest quality orchards bear the Ambrosia logo with the special seed.